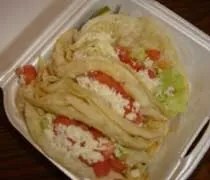 Three chicken tacos from El Oasis inside Tony's Party Store in Lansing. We don’t usually do Mexican. I can handle tacos and I make them at home all the time, but other than that, I’m not really into a lot of the traditional Mexican food. My girlfriend’s not a huge fan either, but she does like more than I do. We’ve both read at Runs With Spatula, about the little taco stand inside Tony’s Party Store on Cedar. We made our weekly shopping trip to Wal-Mart (review HERE) and Horrock’s (review HERE) and wanted to stop somewhere for lunch. We had milk this time, so stopping for a sit down meal wasn’t an option. El Oasis is close to home and not that far off the Interstate, so that’s what we decided on.